The new Haix: Airpower XR1 Dual-Certified Wildland Station Boot is one we want you to know about. Isn't a wrinkled inner or one that pulls out annoying?? Well with the Airpower XR1's Secura Liner, it will never wrinkle up or pull out over time! The Sun Reflect leather helps to keep your feet cooler when working in direct sunlight. This is awesome because your feet don't need anymore heat, avoiding stinky situations. The Haix Arch Support System helps support your foot and keeps it in its natural, ideal position. When wearing these boots for long periods of time, you will be comfortable. That? Is priceless. 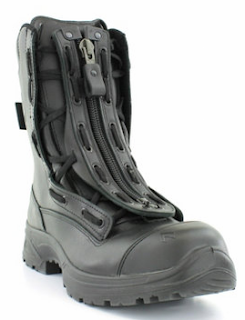 This boot also has a carbon protective toe cap and exterior rubber toe camp, along with a puncture protection sole. The entire inner liner is CROSSTECH--so it's waterproof, breathable, bacteria, chemical and bloodborne pathogen resistant. "Switched to Haix last year. Bought boots at FDIC and havent looked back. Most comfortable duty boots I have ever wore. Lightweight, Reflects hot sun, very durable. I recommend very highly. Little expensive, but well worth the price difference." Don't wait, get your Haix Airpower XR1 Wildland, EMS, Station Boots, today.